I got this recipe few months before in Thursday Magazine's Spices and Flavors section. In that they published this recipe from Washington Post. I kept the recipe to try for this Christmas. I saw this recipe paper a day back and instantly tried and we liked the recipe a lot. The taste and the texture of the curry is bit different. But the masalas used are all Indian spices so the curry suits to Indian palatte. 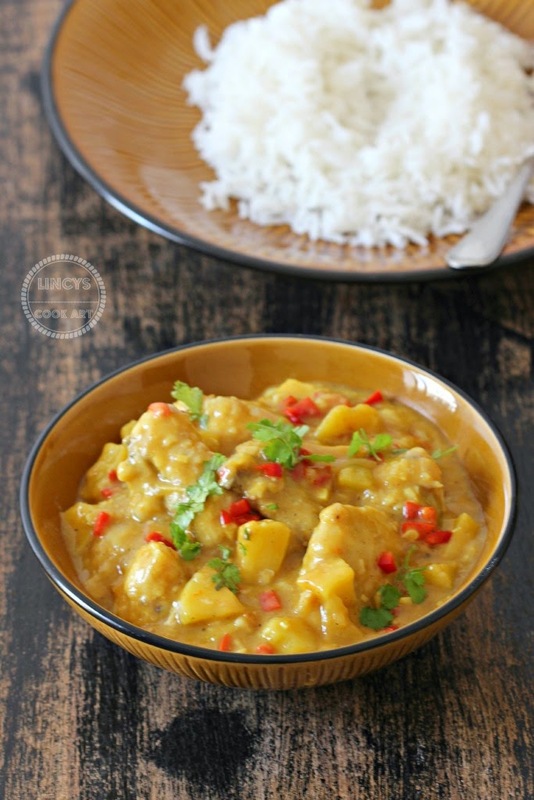 The texture of the curry is little soupy and new for me but it goes well with plain rice. I have served with Basmathi rice. U can serve with Basmathi or Jasmine rice. Mild sweetness from the apple and the juicy chicken. Different from normal chicken curry. Perfect dish to try for some change in cooking. Cut the onion, garlic, celery, red capsicum in to small dice; combine them. Peel and core the apple and cut the apple into small bite size pieces. In a plate take 2 tablespoons of all purpose flour and season with 1/4 teaspoon of pepper and salt. Add the chicken pieces and roll well to coat the flour evenly all over the chicken pieces. Heat 2 tablespoons of oil in a broad pan and add the coated chicken (shaking off the excess flour). Cook until lightly browned on the outside, the chicken might not be cooked through. In the same pan heat a tablespoon of butter and a tablespoon of oil together. Add the onion, garlic, celery,capsicum and pinch of salt. Cook for 5 minutes until the veggies are soft by stirring occasionally. Add the apple and stir well to incorporate and cook for about 5 minutes. Then add a tablespoon of flour over the mixture ad stir to incorporate. Cook for a minute to allow the flour to roast. Add 3 cups of water(or)chicken broth and mix well then add the chicken pieces and any accumulated juices from the chicken. Cook the curry in medium flame and cook for about 10 minutes, stirring occasionally. The mixture continue to thicken as it cooks, and the chicken should be cooked through. Taste the curry and season with 1/4 teaspoon of pepper and salt. Chop some coriander or parsley and add on top of curry before serving. Really it is different, interesting and tempting dish. 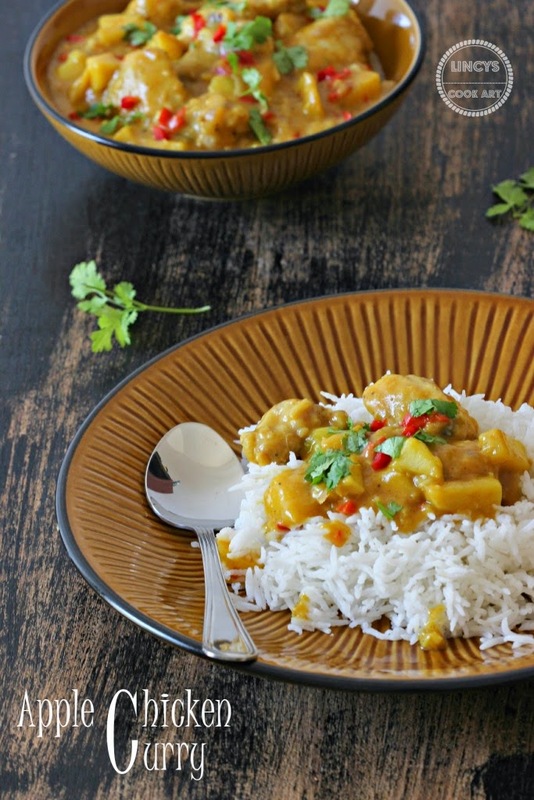 Very different yet fabulous chicken curry. I cant wait to try this meal, thanks, I will let your know how it goes.